Much of the Oneida Lake watershed is characterized by productive soils, favorable climate, and good market outlets for agricultural products. Over 400 commercial, full-time farms currently operate almost one-third of the land within the 872,722-acre Oneida Lake watershed. The majority of these farms are dairies located within Madison, Oneida, and Onondaga Counties. This file is 0.53 MB. Appropriate geologic settings combined with a suitable climate result in the Oneida Lake watershed having a wealth of groundwater resources throughout much of its watershed. Despite the overall abundance of groundwater, dry wells and limitations on groundwater availability are arising more frequently due to spatial variability in aquifer yield, seasonal and interannual fluctuations in precipitation recharge, and complications associated with land use, overwithdrawl, and groundwater contamination as development pressures increase, particularly in the southern portion of the watershed. Portions of Lewis, Madison, Oneida, Onondaga, Oswego, and Cortland Counties drain surface water and groundwater to Oneida Lake. A digital elevation model (DEM) is a digital file consisting of terrain elevations for ground positions at regularly spaced horizontal intervals. Within the Oneida Lake watershed, the highest elevations occur in the Appalachian Upland and Tug Hill Upland regions. This file is 0.32 MB. The Oneida Lake watershed has an extensive surface water network. The Tug Hill region in the northern portion of the watershed contributes approximately 67% of total surface inflows, in part, as a result of the large volume of snow that falls in the region. The New York State Canal System traverses the Lake Plain region as it flows east to west through the Oneida Lake watershed. Water exits the watershed through the western end of Oneida Lake via the Oneida River where it eventually makes its way to Lake Ontario. This file is 0.42 MB. Hazardous waste in New York State includes materials generated from certain industrial processes or materials which are flammable, explosive, corrosive, or toxic. There are 11 inactive hazardous waste sites in the Oneida Lake watershed, located primarily in the southern portion of the watershed. This file is 3.62 MB. There are 30 solid waste facilities in the Oneida Lake watershed. The facilities are located throughout the watershed in both rural and urban areas. A mine is any excavation from which a mineral is produced for sale or exchange, or for commercial, industrial, or municipal use. There are 161 mines located within the Oneida Lake watershed. Sand and gravel is the primary commodity excavated within the watershed, though industrial sand, topsoil, limestone, clay, glacial till, and shale is also extracted. The collection and treatment of wastewater is important to safeguard public health, protect water quality, and ensure the overall survival of a region. There are 14 municipal wastewater treatment plants that discharge within the Oneida Lake watershed. Under the Federal Clean Water Act (CWA) a permit is required to discharge point-source pollutants into waters of the United States. In New York State, the NYS DEC is the permitting authority of the State Pollutant Discharge Elimination System (SPDES) program. In the Oneida Lake watershed, 157 facilities are individually permitted under the SPDES program to discharge to Oneida Lake and its tributaries. Note: all classifications above "D" support fish propagation and (T) designates trout spawning. This file is 0.54 MB. The Oneida Lake watershed spans three unique topographic areas: the Lake Ontario Plain, the Appalachian Uplands, and the Tug Hill Uplands. Oneida Lake and its adjacent wetlands are located in the Lake Ontario Plain region. This area is also commonly referred to as the Erie-Ontario Lowlands or the Oneida Lake Plain. 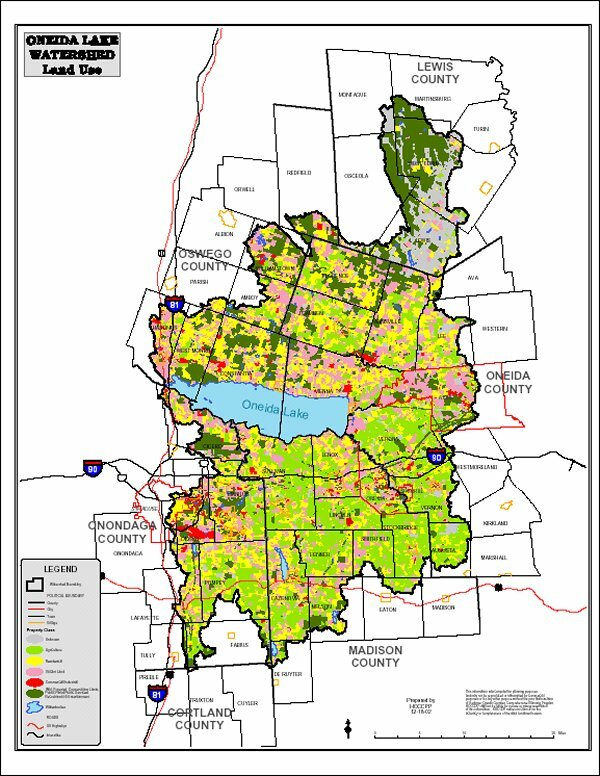 Approximately 262,164 people live in the Oneida Lake watershed according to the U.S. Census Bureau's 2000 statistics. The Tug Hill Upland region is the least populated area within the watershed. This file is 0.76 MB. Prime farmland is an important resource, as it can be farmed continuously or nearly continuously under proper management without degrading the environment. Prime farmland has the soil quality, growing season, and moisture supply needed to produce sustained high yields of crops economically when treated and managed. This file is 1.12 MB. The Priority Waterbodies List (PWL), published by the NYS DEC, was last updated in 1996 for the Oswego-Seneca-Oneida Rivers Drainage Basin. The list includes surface waters that cannot be fully used as a resource and/or have problems that can damage their environmental integrity. The PWL list only includes waters with known or suspected problems. There are 23 segments listed on the PWL for the Oneida Lake watershed. The soil erodibility K factor indicates a soil's susceptibility to erosion. It is based on soil texture, organic matter content, permeability, and other factors inherent to soil type. A low K value means that the soil is more resistant to erosion. Conversely, a soil with a high K value means that the soil is less resistant to erosion. Soils in the Oneida Lake watershed are relatively young, closely related to the parent material in which they formed, and usually not seriously depleted of soluble nutrients. Agriculturally productive soils are generally found in the Lake Plain region, valley floors, and the level areas of the Appalachian Uplands. In contrast, the Tug Hill Uplands in the northern Oneida Lake watershed are characterized by shallow, acidic soils most suitable for forests. This file is 3.32 MB. The Oneida Lake watershed offers a variety of parks and recreational facilities for the outdoor enthusiast. New York State recreational land is located throughout the watershed and offers a wide range of activities such as swimming, hiking, bird watching, fall foliage viewing, golfing, cross-county skiing, snowshoeing, snowmobiling, hunting, fishing, trapping, and camping. The Oneida Lake watershed is composed of seven primary subwatersheds that drain groundwater and surface water from a six county region directly to the lake. This file is 0.27 MB. The Tug Hill Region is often referenced by the political subdivision of municipalities included under the guidance of the Tug Hill Commission. Municipalities within the entire Oneida Lake watershed situated north of the Lake (except for the City of Rome) are included under the coverage of the Tug Hill Commission. 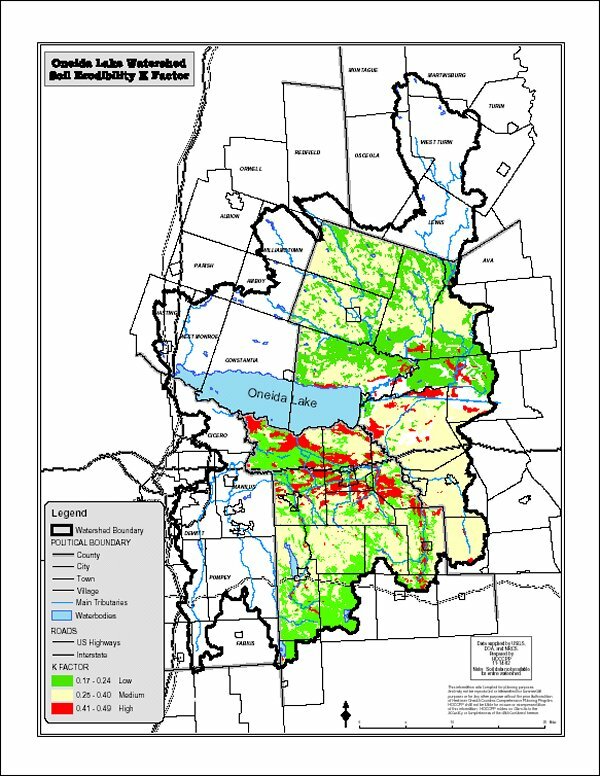 The Oneida Lake watershed contains portions of 69 municipalities and includes 872,722 acres (over 1,360 square miles) of land draining parts of six counties. Development of the State of the Lake and Watershed Report (SOLWR) has provided an opportunity for stakeholders to identify important information regarding local issues of concern for the lake and watershed. These issues are summarized in Chapter VI of the SOLWR. Due to the large size of the watershed, the issues are presented in six separate sections, based on watershed regions: the Limestone/Butternut, North Shore, Northern Uplands, Eastern, Southern Uplands, and South Shore regions. This file is 0.29 MB. Wetlands are found throughout the Oneida Lake watershed but are especially concentrated in the Lake Plain and the Tug Hill Upland regions. Wetland types found in the watershed vary from forested, seasonally flooded swamps to open marshes of grasses, sedges, and other low growing species. Riparian habitat can be found along perennial streams and rivers in the watershed. The NYS Department of Environmental Conservation regulates wetlands 12.4 acres in size or larger. Four ranked regulatory classifications of wetlands have been established based on the degree of benefits supplied. Class I wetlands have the highest rank, and the ranking descends through Classes II, III, and IV. This file is 0.51 MB.